I have absolutely no clue what kind of jellyfish these are or where they come from, but they're washing up all over Moonee Beach of late. I have never seen anything like this in my going-on two years of living here permanently. I know.. I -kind- of take back not wanting to get into the water, I bet they look rather amazing swimming... I just wouldn't want to get in their path! That certainly looks like them! Hehehe, "Jelly Blubber" is a GREAT name too! They don't -look- harmful, but then again I haven't been brave enough to touch one yet. 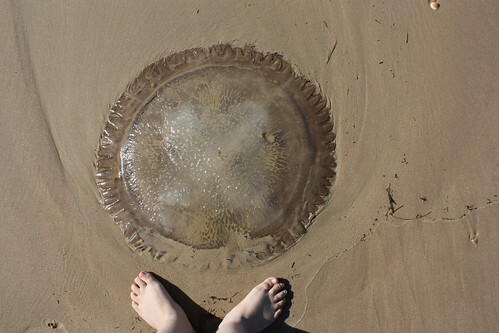 I've heard of the giant jellies up in Japan, but I had no idea they came down to Australia, and are even considered common! But yeah.. these guys are -definitely- larger then 35 cm. In fact so far I'm not sure I've seen one smaller then 35 cm, at least not washed up on the beach. 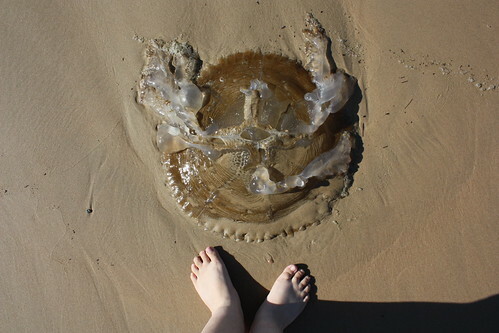 I've read lots of articles that suggest warmer waters will mean we'll be seeing a lot more jellyfish in the waters, but no one told me about giant ones! I've heard about the giant jellyfish they get off Japan's shores, but I didn't think they'd be down in our waters... Shadow_5tails above linked to a wiki article of what they most likely are, which ARE common to Australian waters, but don't seem to suggest they get quite this big. It's a bit of a mystery!